This film is a fictionalized account of the sinking of Pakistani submarine Ghazi (holy warrior) during the India-Pakistan war of 1971- the liberation of Bangladesh . The Indians have said that Ghazi was sunk by Indian naval warship INS Rajput while the Pakistanis have said that it was sunk either by it’s own mines which it hit by mistake or by internal explosion. But the real happenings are a mystery and thus fodder for a fiction film. The film is in hindi officially but since many of the officers in the armed forces rely on english for orders and communication it can be called a bilingual film. 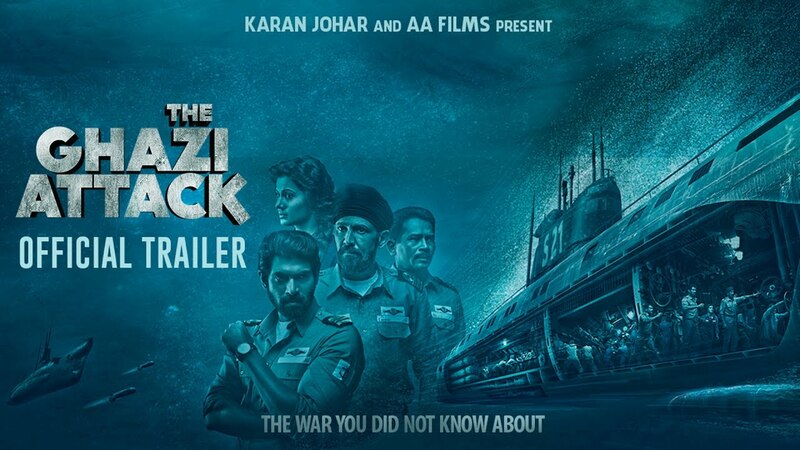 The film starts with a RAW (Indian spy agency) agent (Milind Gunaji) giving information to the top brass of the Indian navy (headed by Om Puri) that the dreaded Pakistani submarine Ghazi is headed to the bay of Bengal to threaten the Indian navy aircraft carrier INS Vikrant. The Ghazi is justly dreaded because it is more advanced than Indian submarines and was capable of protecting the entire Pakistani navy from Indian naval attack in the previous 1965 war. The Indian navy submarine S-21 is sent to challenge it and the result is a classic battle of maneuver and counter-maneuver and fire and counter fire. Even though the technology to make the film is a bit inferior by western standards, it a kind of film that authors who have written novels of sea warfare like Alistair Maclean and Tom Clancy would relish. And what it lacks in technology is made in terms of emotion and patriotism. The Indian submarine is headed by a passionately headstrong officer Ranvijay Singh (played by Kay Kay Menon). And to control his rash nature is sent another officer Arjun Verma (Rana Daggubati). As if to moderate the clash between the two is a third officer Devraj (Atul Kulkarni) . In the first half it is the hot temper of Kay Kay Menon which dominates. From countermanding orders by high command to putting his gun on Daggubati’s head, he does it all. Rana Daggubati gets chance in the sun only when Menon is out of the way. The Pakistani commander Razzaq is played by Rahul Singh, who is as wily as it gets. The Bangladeshi refugee played by Tapsee Pannu is forgettable. As the movie heads into the second half, so do the stakes get racked up. And as the stakes become higher, so does the high voltage drama. This is film that gets better and better as it nears it’s climax which is exactly what makes for a good film. The real winner is the recreation of the interior of a 1970s submarine and the exact detail to which the naval atmosphere and working and language is neatly shown. But all this is understandable only to educated urban audiences and uneducated and rural folk might be out of sync with the proceedings. The film ups the ante of patriotism by making the crew sing patriotic songs as the film reaches the climax of tension; songs which are faintly heard across the waves by the crew of the enemy submarine. This is not total fiction as it sounds but there have been occasions in real warfare when crew of sinking ships and downing subs have sung national anthems before everything came to an end. By Bollywood standards of course, the film scores high on technical perfection with majestic shots of submarines going underwater and rising up again against the backdrop of the setting sun. The cat and mouse game of torpedoes being fired from various angles, the ‘ping’ on the sonars when they approach, the tension on the crew’s faces when the torpedoes come close, the relief when they miss- all seems real. As a person who has seen Hollywood films on submarine warfare, it is familiar to me. But to an Indian who has never seen such stuff-will he or she understand it? That is the big question. Acting by everyone is good but patriotic songs and national anthems are all you get as music; in fact there are no other songs though background score is authentic. Photography is good and colours are decent.